We ventured out of the city on Saturday. I've never seen the Golden Gate Bridge so foggy- you couldn't see the towers until you were directly under them! It was really amazing. I wish I could have gotten a nice photo, but I didn't. 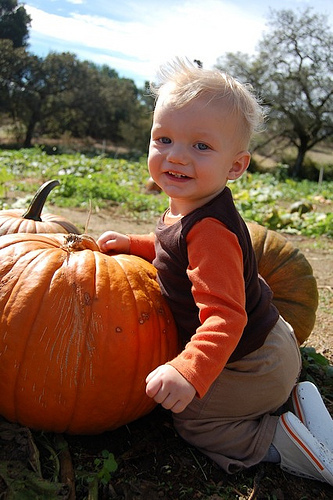 We headed up to Petaluma to check out Peterson's Farm and get a few pumpkins! It's such a lovely farm and very family-friendly! There are horses, cows (long-haired, Highland Scottish), rabbits, geese, cats, dogs, and a bee hive! Most of the animal pens have buckets of food so you can feed them (for free). The have a great field in the back full of pumpkins. We picked a few, took some photos, had lunch at a deli downtown, and then headed back to SF. A lovely & thorough review of the farm, including directions, can be found here.